Matt Rix’s Trainyard [99¢ / Free] has actually been available on the App Store for quite a while now, but it wasn’t until the recent Retina Display update that it popped up on my radar. 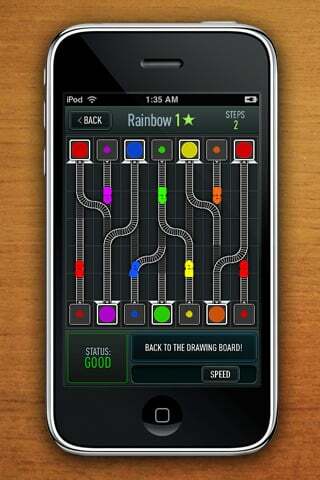 Trainyard is a puzzle game which, as the title hints, involves routing trains around. The games begin with a long tutorial (almost too long) that goes over all the basics of the game. In a nutshell, everything takes place on a 7×7 grid which begins filled with two or more train stations, one that the train comes from and one that the train needs to go to. Initially routing these trains around only involves drawing track between each color coordinated station, but before long you’ll be routing multiple colored trains from the same originating stations through various switched pieces of tracks to several different stations. 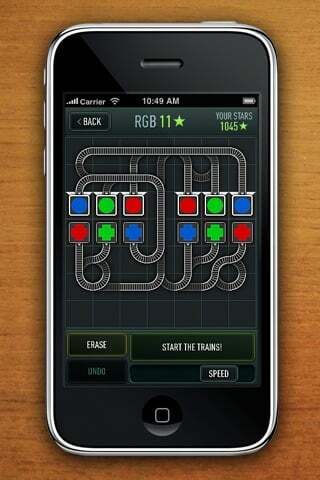 Some puzzles even involve combining trains. For example, one of the levels has a red and blue origin station and a purple destination station. On this puzzle, you need to lay track so the trains collide (oddly enough making one purple train instead of crashing), then send it to the purple station. All of the elements of Trainyard go together very well, and the variety of the different included puzzles is impressive. What I like most about it though is that unlike a lot of puzzle games where there is usually only one solution (or a slightly more difficult solution to collect whatever bonuses some games have), many Trainyard levels have hundreds. I know this because of yet another clever feature in the game that allows you to submit your solution to an online solution database that shows all the unique solutions to each of the levels that have been submitted. This is useful not only if you’re stuck, but also if you beat a level and want to see if someone did it more efficiently (or in some cases, much more convoluted). Trainyard is currently the target of a limited time 99¢ sale, and I really recommend picking up the game if you’ve been looking for another great puzzler to sink some time in to. 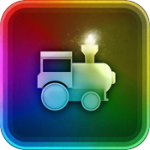 Unlike many train routing games, Trainyard doesn’t require fast reactions at all, making it perfect for even the most casual gamers. Also, if you’re interested in a behind the scenes look at what went in to Trainyard Matt posted an incredibly comprehensive blog post on his adventures in game development that’s also worth checking out.